In California, the legacy of the Civilian Conservation Corps (CCC) can be found in our State Parks. 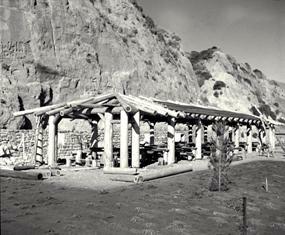 The CCC developed the infrastructure for the young park system, from unique projects such as the reconstruction of Mission La Purisima Concepcion, to planting trees and landscaping. Californians have a profound sense of gratitude to the visionary government leaders and the hard working young men of the three C's. In 2008, California State Parks commemorated the 75th anniversary of the establishment of the Civilian Conservation Corps. These online presentations along with the many historic photographs describe the work of the CCC and its contributions to our Golden State. The Civilian Conservation Corps was the most popular of the New Deal programs created by President Franklin Delano Roosevelt to provide relief and a speedy recovery from the Great Depression. From 1933 to 1942, the CCC put some two million young men to work on a massive building program in Americas' parks and forests. 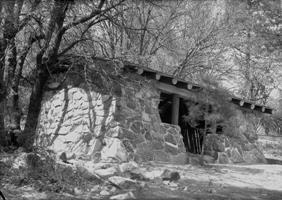 Roads and trails, campsites and social halls, amphitheaters and visitor centers numbered among the many features constructed by the CCC that provided the public with unprecedented access to the nation's natural and historic treasures. But the CCC was more than just a make work program. It offered the enrollees a renewed sense of dignity and hope for the future. They were not only earning a living, they were doing something important for their country, and they knew it. "It is time for each and every one of us to cast away self-destroying, nation-destroying efforts to get something for nothing, and to appreciate that satisfying reward and safe reward come only through honest work." 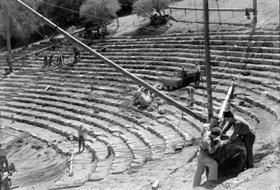 Pictured: Top right construction of the Mount Tamalpais Mountain Theater, 1936. 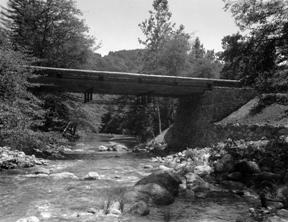 Top left Weland Bridge at Pfeiffer Big Sur, 1938. 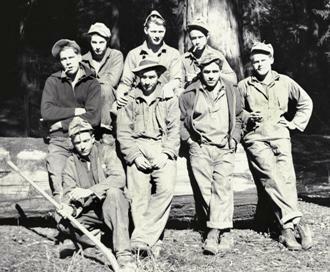 Center CCC planting crew members at Camp Humboldt Redwoods in 1935. Bottom left Paso Picacho stone shelter at Cuyamaca Rancho, 1936. Bottom right Seacliff picnic ramada, 1935.